I’m just bad at keeping up with the blog. I’m on the go a lot, and when I’m not on the go I’m tired or planning what to do next. So I’ll give a few highlights from my last two days in Prague. I’m gonna blow through it quickly and touch on the things that I really don’t want to forget, and I’m going to go kind of stream‐of‐consciousness. But this was the Czech Philharmonic, conducted by Semyon Bychkov. They are widely considered to be in the first rank of great symphony orchestras in the world. So I went. There are no words. Maybe just one: sublime. I would rank this as one of the best classical music performances I have ever attended. The orchestra played brilliantly, but they don’t get all the credit. I have never listened to Mahler’s Ninth Symphony before, neither live nor in a recording. There is again, maybe only one word to describe this piece: sublime. The final section of the last movement, I was just awestruck. When it ended, the sound stopped, but the music continued. I think Bychkov held the orchestra and the audience in suspended animation for at least thirty seconds before lowering his arms and accepting the ovation. I’m still getting chills as I write this. I got a recommendation for a guide to take me through the Jewish Quarter, and this turned out to be a wonderful decision. Renata Blazkova gave everything so much meaning and context. Visiting the Jewish Quarter is actually a visit to five synagogues, the cemetery, and the ceremonial hall. 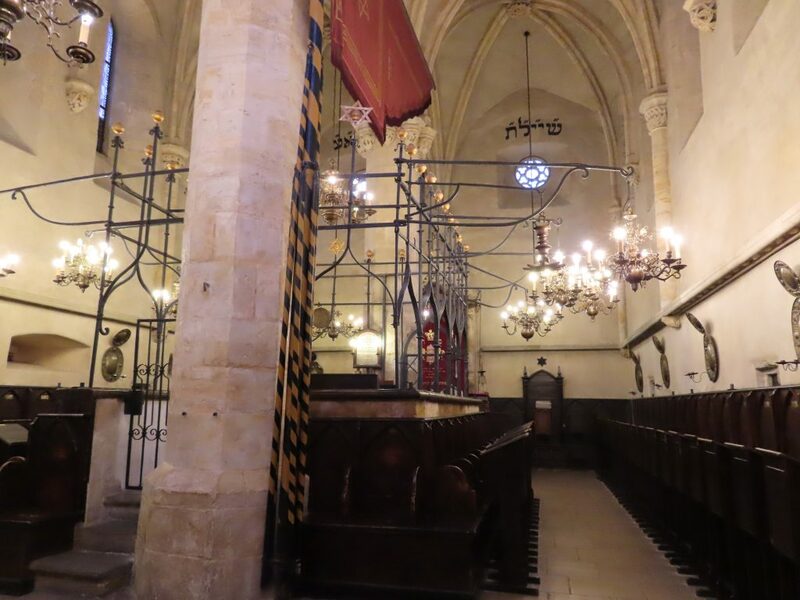 Only one of the synagogues is still used for worship; the others have been turned into museums, each of which sheds a different light on the history of the Jews in Prague and in the Czech lands. The Old‐New Synagogue, built in 1270, is the oldest active synagogue building in Europe. It is not like any synagogue I’ve ever been in. The seats are around the perimeter, the bimah in the middle, the women’s gallery in a narrow hallway with tiny windows. The synagogue was built by Christians, because Jews weren’t allowed in the building professions at the time. 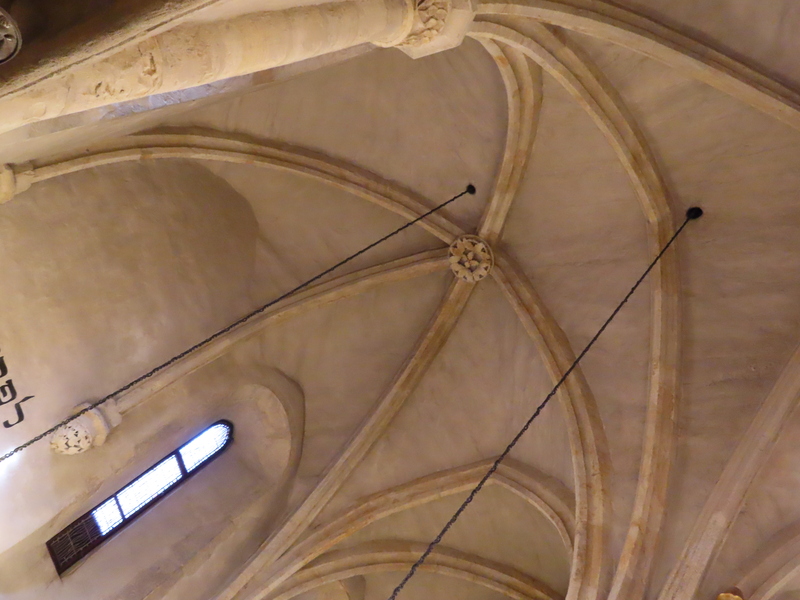 Renata pointed out that the vaulted ceilings have five ribs instead of the more common four that can be seen in Gothic churches. Four ribs create a cross, inappropriate for a synagogue, but the fifth rib made it look a little awkward. The Klausen Synagogue has displays on religious observances. On the ground floor are collections of Torah breastplates, finials, and pointers, plus areas devoted to each of the Jewish holy days. Much of this evoked memories from childhood. Seder plates, lulav and etrog, shofars, chanukiahs, Sabbath candleholders, and much more. Upstairs were displays related to the rituals of life and death: good‐luck amulets to ensure a healthy baby, circumcision tools, tefillin and tallit with bags, chupah, mezuzah. Where did all of this come from? Many of these were items were confiscated when the Jews of Prague and elsewhere in Czechoslovakia were deported to Terezin. The Nazis planned to create a “Museum of the Extinct Jewish Race.” The Old‐New Synagogue was to be part of the museum; the other synagogues were used as storehouses for all the religious objects. That’s why none of the synagogues here were destroyed. Upstairs at the Pinkas Synagogue were drawings from the children of Terezin. This was not a death camp, but a deportation camp. Many people died there of disease and starvation, but the Nazis used it as a propaganda tool. The Red Cross visited on June 23, 1944. In advance of their visit, the Nazis conducted a beautification program at Terezin and increased transports to Auschwitz to relieve overcrowding. The Red Cross reported favorably on conditions at Terezin. The children’s drawings depict many aspects of life before and during their time in the camp. They really show the hope and optimism young children should experience. It is all the more tragic that so many of these children perished. The home of the National Library was built by the Jesuits in the 17th century to house a university. 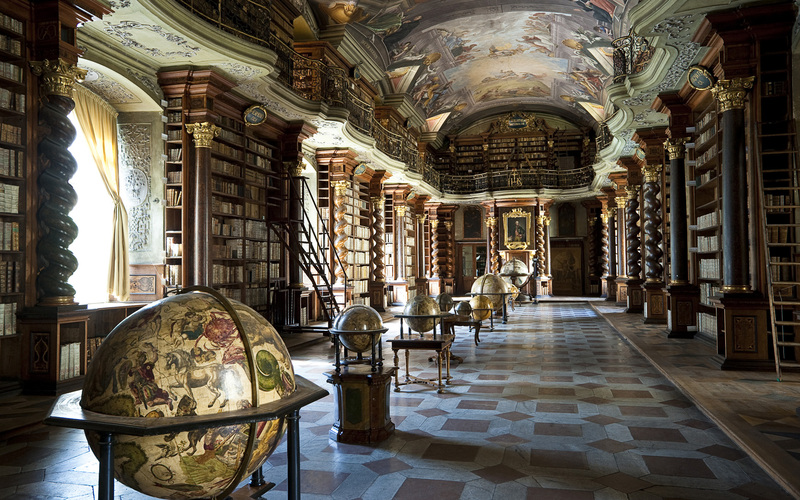 In the 18th century it became a library, and today it holds 6 million volumes. A tour is required to visit the highlights: the beautiful room which houses the original library, the observatory tower, where astronomers studied the skies and also had a large camera obscura that was used to determine solar noon, and the viewing platform at the top, with some grand views. The views from the top of the observatory tower were most impressive. Here are a couple of photos. There’s also a lovely chapel, called the Chapel of Mirrors, where concerts are held. 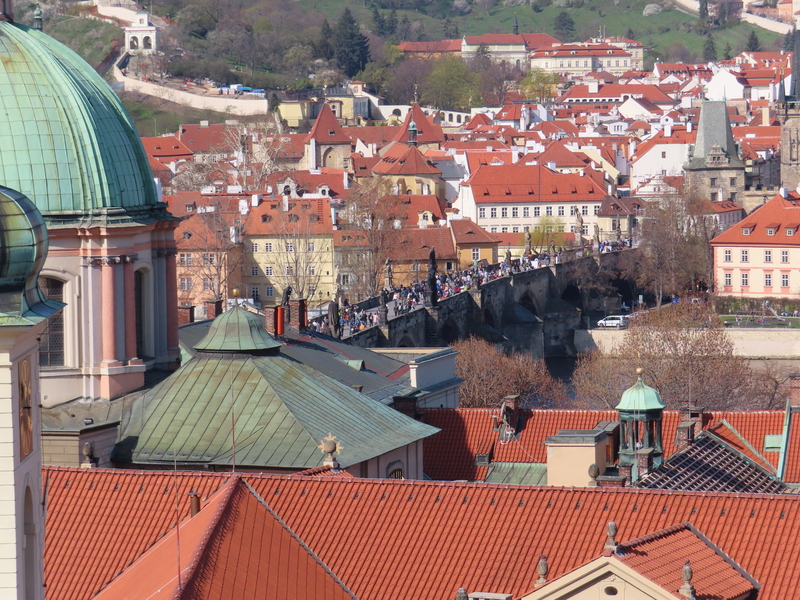 This neighborhood has a self‐guided walk described in Rick Steves’ Prague guidebook. It required a ride on the metro to get there and a tram ride back. Most of the walk is in a park that was created on the site of a 17th‐century fortress. 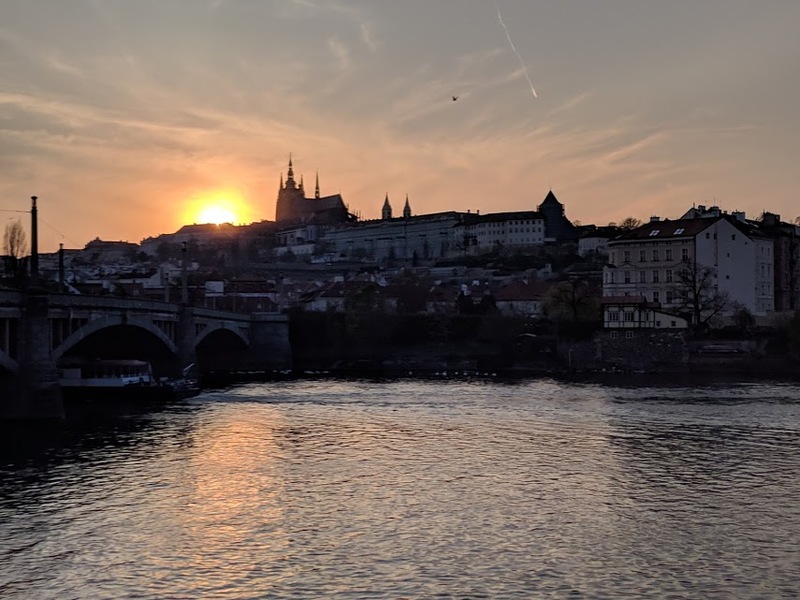 It was enjoyable because the weather was perfect (as it has been for the entire trip so far) and the views were impressive, and because Prague is just such a lovely city to be in. 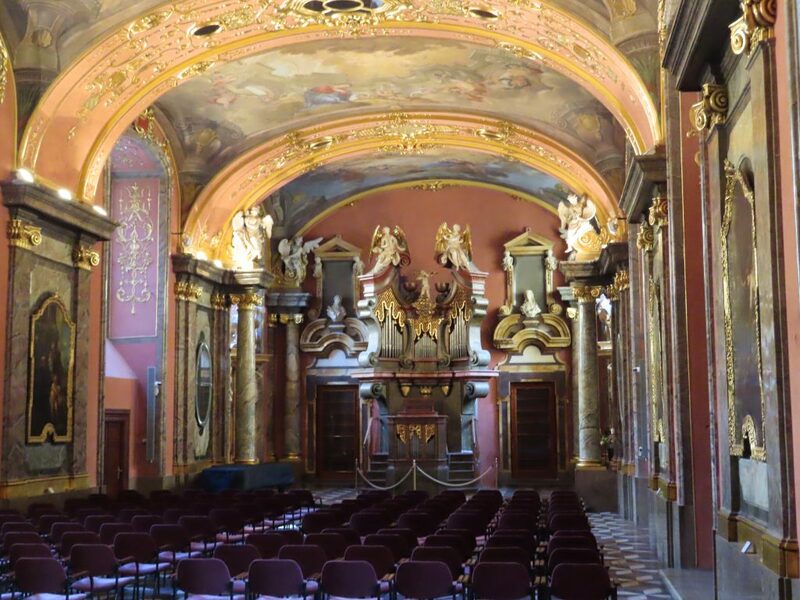 Among the other museums I visited in Prague were the Mucha Museum, the Jerusalem Synagogue (an early‐twentieth‐century synagogue that is not in the Jewish Quarter), the Museum of Communism, and the Museum of Medieval Art. All of them were good. But here’s my takeaway: Prague isn’t a museum city. It’s a city that is a museum. I could easily have skipped all of these and not missed much. The highlights I’ve described above, plus the ones in my previous post, made my visit here just fabulous. I went to see a performance of Mozart’s Don Giovanni at the National Marionette Theater. I wish I hadn’t. I thought it would be charming, but it was just dopey. So this afternoon I took the train from Prague to Dresden, a little over two hours. The Prague train station was actually quite interesting. It is a Communist‐era building, except hidden away upstairs is an Art Nouveau hall that remains from the original station. The station was originally named for Emperor Franz Josef. After World War I it was renamed for Woodrow Wilson, whose promotion of self‐determination helped in the establishment of the free state of Czechoslovakia in 1918. Then under the Communists it was renamed “Hlavní Nádraží” — “Main Station.” Their expansion hid the original design but didn’t eliminate it. Moving forward on this blog, I’m going to write less and more often. At least I will try. Remember at the beginning of this post when I said “I’m gonna blow through it quickly.” Oh well. Prague sounds so beautiful and majestic. Do I have a password for this site? I don’t remember. 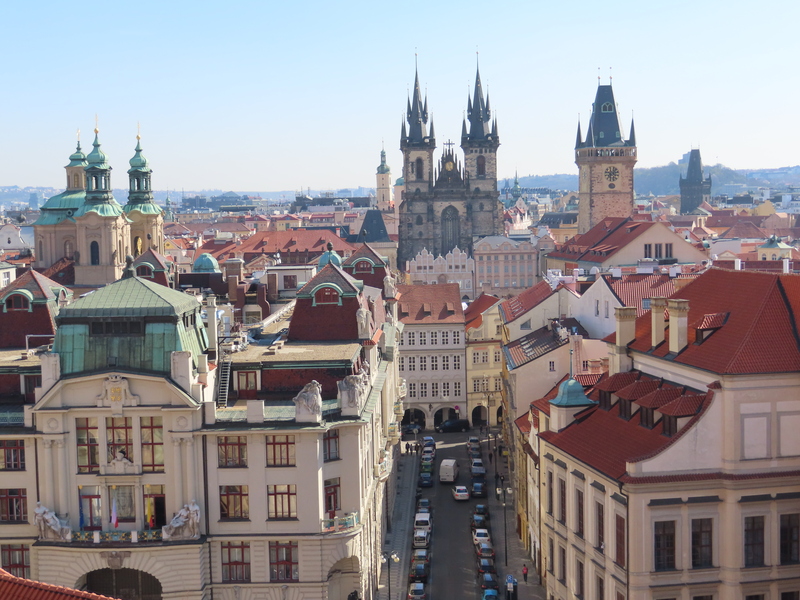 Prague sounds like the place to go for an injection of culture and intellect and beauty and history. ! !